Court adjourns Sen. Misau’s trial until July 3 – Royal Times of Nigeria. An FCT High Court, Maitama, on Tuesday adjourned till July 19, a case of alleged injurious falsehood preferred against Sen. Isah Misau, to enable counsel to address the court on a subpoena issue. The case which was supposed to hold on June 18 ­was adjourned with the consent of counsel in the matter until July 3 . Mr Paul Erokoro (SAN), Misua’s counsel, had earlier told the court at one of the sittings that the subpoena was for the prosecution to produce some documents in relation to the alleged offences. Justice Ishaq Bello, after listening had adjourned until Feb.22, March 13, April 25, May 22, June 18 and now July 3 for counsel to address the court on the subpoena issue. Misau, the Senator representing Bauchi Central Senatorial District, was arraigned on a seven-count charge, bordering on injurious falsehood. Izinyon had told the court that between Aug. 27 and Oct. 5, 2017, the defendant made some injurious statements against the Inspector General of Police, Ibrahim Idris. He said the defendant also made similar statements against the Chairman, Police Service Commission, Mike Okiro, adding that the information was widely circulated through some media houses. 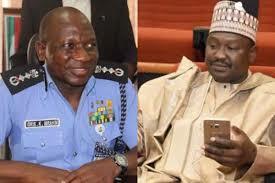 Misau had earlier pleaded not guilty to the allegations leveled against him.